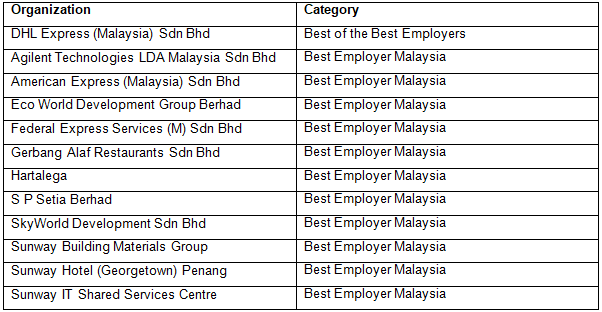 Aon, a leading global professional services firm providing a broad range of risk, retirement, and health solutions, has named twelve organizations as Best Employers in Malaysia for 2018. Despite half of Best Employers experiencing significant changes such as mergers and acquisitions, new leadership and a change in strategy, they increased revenues by an average of 15% (market average 3.88%) and profits by an average of 7.8% (market average 1.08%). In an evolving business environment, Best Employers inspire their employees with a compelling vision. 87% of employees in Best Employer organizations agree that their senior leadership provides them a clear direction for the future (30 points higher than market average). In addition, Best Employers have a total rewards strategy in place that focuses not just on pay but learning and career development opportunities as well. 79% of Best Employer employees feel that they receive appropriate recognition for their contributions (27 points higher than market average). DHL Express Asia Pacific was also recognized as Aon Best Employer 2018, Asia Pacific, after being named Aon Best Employer in India and Singapore earlier. Marriott International Malaysia was named Best Employer 2018 through the global programme.